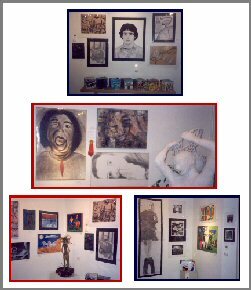 This Century Art Gallery hosted its first annual “High School Student Invitational Show” November 11 - December 19, 2003. All high school students from Lafayette, Jamestown, Bruton, Walsingham Academy and Williamsburg Christian Academy were invited to submit original artwork to their respective Art Departments, and the teachers and TCAG representatives juried in the work. All mediums were represented, including painting, drawing, photography, sculpture and pottery. Award-winning painter, Fred Czufin, former Creative Director for a large advertising agency and presently a member of the Muscarelle Museum Exhibitions Advisory Board, served as judge for the show. Prizes were awarded to the show’s winners at an Awards Ceremony on November 12th. This “High School Student Invitational Art Show” continues the mission of This Century Art Gallery to provide educational and cultural enrichment through outreach programs, including art classes, workshops and lectures. For nearly half a century the gallery has been presenting and promoting high quality arts and crafts to the Williamsburg area through regular exhibits by visiting and member artists plus expanding their outreach efforts to the broader community.